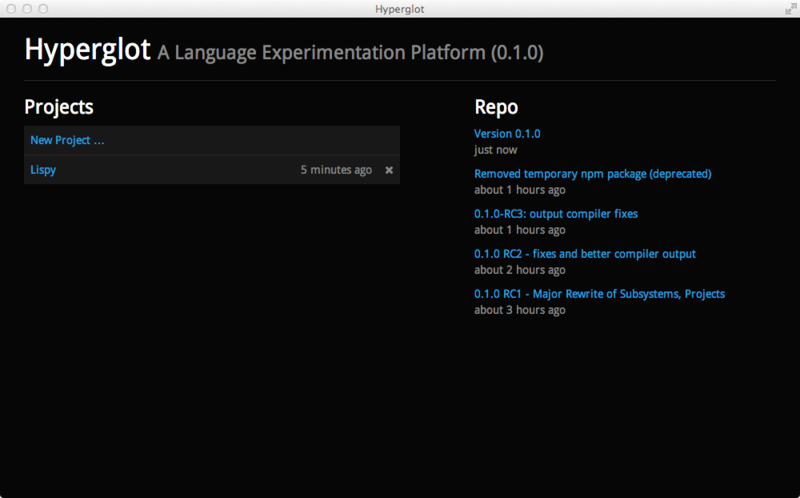 Hyperglot aims to speed up the way you create and develop programming languages or DSLs. You specify a PEG grammar using Spidermonkey AST primitives and you get a compiler back. Simple as that. 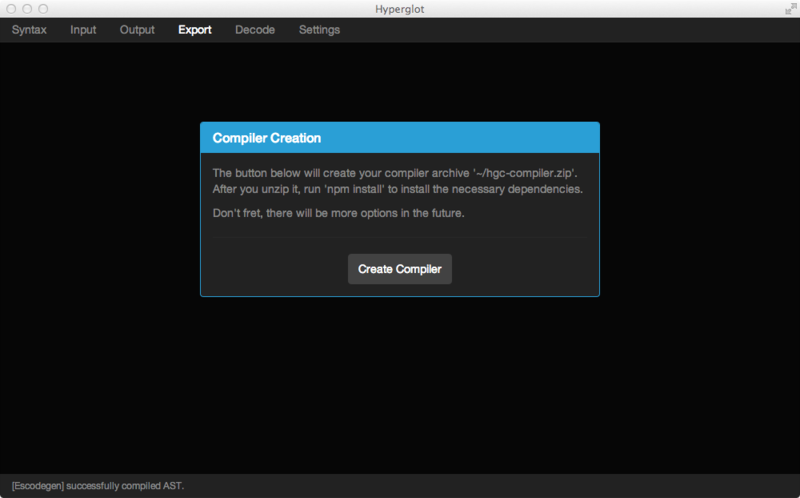 To run a release of Hyperglot, you will need to have a node-webkit binary. 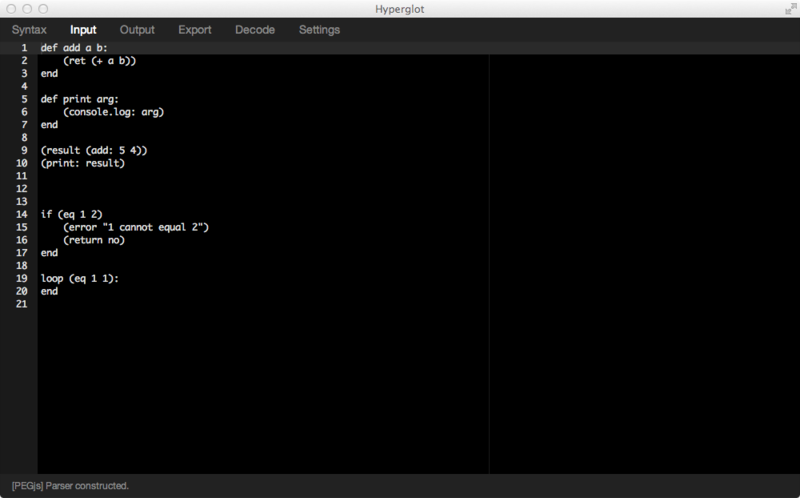 This is the view presented to you when you launch Hyperglot. On the left you have projects you have created. These will be ordered on the basis of most recently modified. To remove a project, simply click the cross to the right of it's name. On the right you have the most recent commits to the public repository. Selecting any of these commits will open your browser with said commit info. 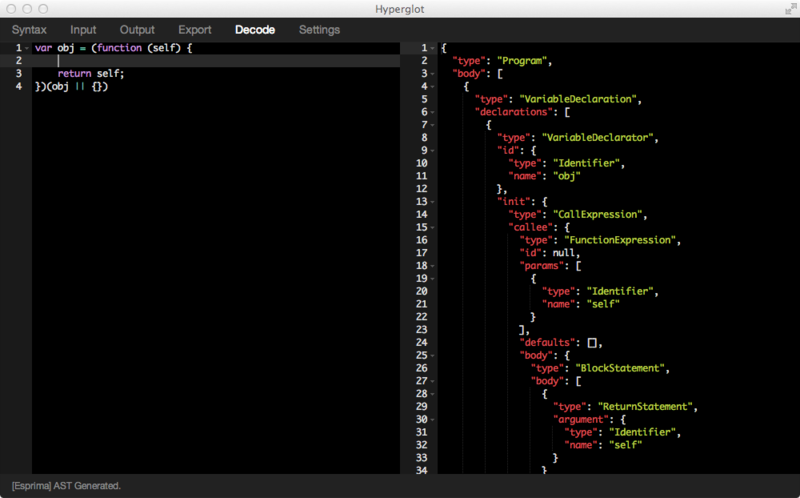 The syntax pane is where you specify the grammar of your language. It is based around David Majda's excellent PEG.js, a parser generator. 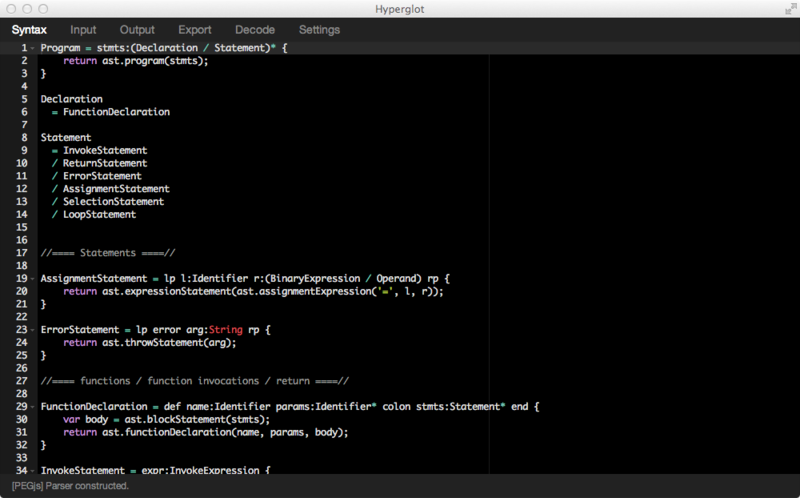 For the syntax of PEG.js, please read it's documentation. PEG.js is great, but to shortcut the time it takes to get a AST up and going, you can access a variable called ast with node type functions as properties. This object follows the Mozilla Spidermonkey Parser API. 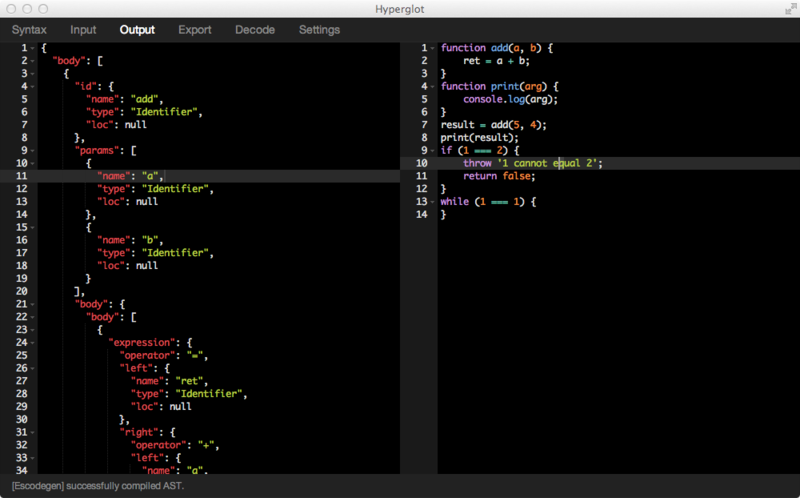 During the writing of your grammar, the bottom bar will notify you of any errors generated by PEG.js. It will also tell you when your parser has been created. The input pane is where you write the source code of your language. If your parser was successfully generated using the Syntax pane, any source language you input into the editor will be parsed by the parser you generated. If the source was successfully parsed the lower status message area will tell you so, and you should move to the Output Pane. If it failed to parse, you will be told so. If your custom language was parsed successfully, the AST will appear on the left. If you used the right combination of AST nodes in your tree, Escodegen will have successfully transformed your AST into EcmaScript. Congratulations, you've built a language! If for some reason it didn't generate source for your input source language, then it's because the wrong types of expressions / statements were used and you need to rework your AST. In the decode pane you can input some EcmaScript and get the AST representation of the code you input thanks to Esprima. Good for determining what kind of AST a particular feature of your lanugage might need to emit. If you have feedback, please create a new Issue on GitHub or review existing issues. Pull requests are welcome. Note: the above is a modified MIT licence. Changes are that you can't sell or relicence Hyperglot. Everything else is fine though!